Road works require different road equipment. 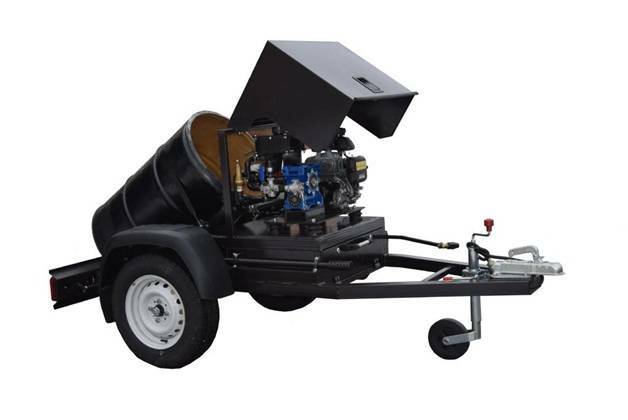 RBE-0,2 by GlobeCore is designed for spraying bitumen on asphalt as part of road works. This equipment can be used at asphalt sealing/surfacing, construction, repairs and maintenance of roads as well as other road facilities objects. Bitumen emulsion sprayer RBE-0,2 consists of tank, frame, protective cover, towing hook, internal combustion engine, gear reducers, bitumen pump, back pressure valve, tank for system washing, rod and hose storage box. It operates with basic ambient temperature ranging +10°С to +40°С and relative humidity 98% at 25 °С. Visual control of emulsion level is possible through the filling opening. Current emulsion temperature is checked prior to loading by a visual thermometer. If work requires other temperature – material shall be previously heated or cooled. Filling the sprayer with emulsion is carried out through the filling opening. Sprayer RBE-0,2 has compact sizes allowing it to be used at small construction sites and house yard territories. Hand operated sprayer allows treatment of hard-to-reach places. GlobeCore RBE models can be bought directly from warehouse. GlobeCore production facilities are located in Oldenburg, Germany. GlobeCore can produce a custom design bitumen sprayer within 45 working days. Road worker executing road repairs and maintenance on time. GlobeCore provides after sales service, has a stock of spare parts and own a production line – GlobeCore always ready to support you! increase performance of road mixtures pouring. 1) Please contact us by email or by phone and we will discuss your order together; 2) We will offer you a range of models and prices, and advise on delivery time. 3) If required – we can meet at our facilities. making roadworks shorter and easier. How long is a guaranteed service time? 12 month from product commissioning, but no longer than 2000 hours of operation. Does equipment operate in potentially explosive atmosphere? No, it does not. What kind of bitumen emulsion can be used in sprayers RBE-0,2? A new emulsion from storage is better, as “old” emulsion may contain debris that clogs the system. Before use bitumen emulsion needs to be heated to a working temperature. Can cationic and anionic bitumen emulsions be mixed? No, they cannot be mixed. What is the spraying width? Jet nozzle can cover a 240mm strip. What needs to be done with residual bitumen emulsion after work completion? It shall be drained.